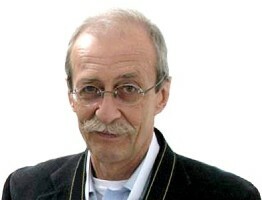 Haroutiun A. Samuelian was born on 3rd November 1947 in Yerevan, Armenia. He graduated at the Yerevan State University (Department of Physics) in 1970. From 1969 to 1983 he was employed in the Institute for Physical Research of the Academy of Sciences of Armenia, where in 1982 obtained a PhD degree. In 1984 – 1990 he worked as the Art Editor and Head Designer of “Mshakuyt” (Culture) Magazine, Yerevan; 1992 – 2004 Art Director of “Namakanish” (Postal Stamp). Since 1993 he acts as the Art Director and Editor of “Khosk” (Logos) Publishing House, Yerevan; 2005 – present Art Director of “Culture & Heritage Forum”; etc. Since 1973 he has been focused to the field of graphic design: illustration and design of magazines, books and other print, development of trade marks, corporative styles, fonts, postal stamps, coins & medals, etc. He published numerous illustrations & cartoons in Armenian and foreign publications and periodicals. Since 1976, he presented his work at more than 25 exhibitions of visual art and graphic design and ca 60 exhibitons and contests of Graphic Humour and Caricature in Armenia, former USSR and abroad. His works won several prizes; the last ones: Grand Prize in the Expert-Sibir magazine contest Novosibirsk, 2005; Prix de la Grenade d’Or at the 1st International festival Yerevan, 2008; 1st Prize at the 3rd Biennial of Humor Penela, Portugal, 2012. Haroutiun Samuelian is a winner of a number of competitions of stamps, emblems, medals, coins, banknotes, etc. He has designed more than 150 postal stamps and is one of the authors of the current State Emblem of the Republic of Armenia. He is a member of the Union of Artists of Armenia; Union of Designers of Armenia, International Association “Society of Designers”; Academy of Philately and Numismatics; Association of Type Designers of Armenia; and Association of Caricaturists of Armenia. Haroutiun Samuelian is living and working in Yerevan, Armenia.